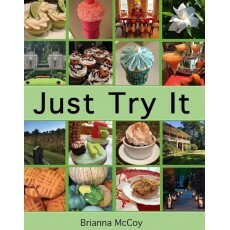 Throughout her childhood, Brianna McCoy’s resistance to try new foods was consistently met with her parents’ urging to “just try it!” At the age of 16, Brianna took that advice and turned it into a captivating keepsake full of delectable delights and precious memories. Brianna’s love of baking— born from the fond experiences she had creating sweet treats with both of her grandmothers— has brought about a beautiful cookbook, full of the favorite recipes made and loved throughout her childhood. It’s all about family! Not only is this cookbook full of family recipes, but Brianna has ties to the DFRC family too! Bob Carpenter, a co-founder of DFRC, was Brianna’s great-great uncle! Carpenter and his wife had a son with an intellectual disability, and were inspired to do something to give their son and others more opportunities to get involved with the community – thus the Delaware Foundation Reaching Citizens with intellectual disABILITIES was founded in 1956. All these years later, as DFRC celebrates more than 60 years in existence, Brianna decided to do something to make an impact on those whose lives have been touched by the foundation her family had such a significant role in creating. DFRC’s Blue-Gold All★Star Football Program invites football players, cheerleaders, band members, and ambassadors from every high school in Delaware to participate in a 5-month program to raise awareness and understanding about the abilities of people who are intellectually challenged. The very heart of DFRC is the Hand-in-Hand Program, which allows Blue-Gold participants to be paired with a young person who has an intellectual disability to create relationships and allow each of them to learn from one another. As a student at Tower Hill School, Brianna was involved in her school’s Blue-Gold Club as well as the Hand-in-Hand program as a junior and senior ambassador and participated in projects and activities that helped to raise awareness and funds for DFRC. Just Try It! is the result of family pride, creativity, skill, determination, and an extraordinary personal commitment to make a difference in the world! All the monies raised from Brianna’s cookbook will be donated to DFRC. Brianna’s efforts will ensure that more people will understand abilities far more significantly than disabilities and share the legacy of DFRC.